Announcement Welcome!!! Onthetrolley is dedicated to art like products and endeavors. Enjoy beautiful, hand lettered art prints, letterpress greeting cards, whimsical screen prints and unique woodcut and lino-prints. Tune in often as the shop continues to grow! Welcome!!! Onthetrolley is dedicated to art like products and endeavors. Enjoy beautiful, hand lettered art prints, letterpress greeting cards, whimsical screen prints and unique woodcut and lino-prints. Tune in often as the shop continues to grow! Ciao Bella Print. 5" x 7" Italian Gondolier Relief Print, linocut. 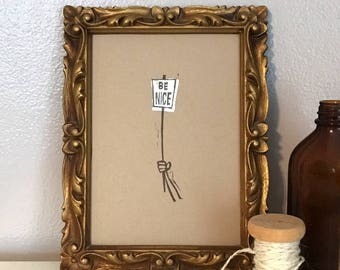 BE NICE Print. 5" x 7" Relief Print, linocut on Kraft paper. Play Music on the Porch Day 2016! 3 Color, Hand Carved, Hand Printed, Linocut Relief Print. Don't Mind If I Do Print. 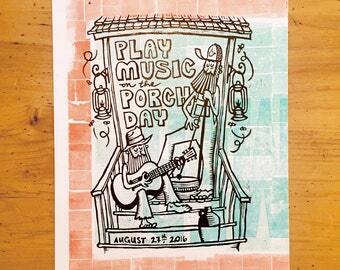 Play Music on the Porch Day! 2 Color, Hand Carved, Hand Printed, Linocut Relief Print. Stand Tall Print. 5" x 7" Relief Print, linocut on antiqued/stained paper. Nice Work, A2 Letterpress Card with Kraft Envelope. Congratulations, Well Done, Nice Work! Mountaineer, 5" x 7", 1 Color Relief Print, Linocut. Butter My Biscuit 10 x 13 Letterpress Print. 2 Color, Limited Edition, Signed & Numbered. Country Chicken Art Print, 2 Color Relief Print, Chicken Illustration - 12.5" x 9.5"
Salt Lake City Temple Print - Beautifully carved woodcut printed on a Chandler & Price antique platen press. SleepTight Print. 5" x 7" Smiling Moon Relief Print, linocut. Pistol Packin' Mama Print. 5" x 7" Relief Print, linocut on kraft paper. Electric Guitar Art Print, 2 Color Screen Print, Guitar Illustration - 12.5" x 9.5"
N is for Narwhal, Be Unique Print. 5" x 7" Relief Print, linocut. Johnny Cash "In Cash We Trust", 5" x 7", 2 Color Relief Print, Linocut. Mockingbird, 5" x 7", 1 Color Relief Print, linocut. Rise & Shine, 5" x 7", 2 Color Relief Print, linocut. Good Day! A Super Duper, 2 Color, Hand Pulled, Signed & Numbered Screen Print. Salt and Pepper 10 x 13 Letterpress Print. 2 Color, Limited Edition, Signed & Numbered. Such a great, simple print and message. I love it! Thank you for the bonus cards, too! Thank you! Loving Mr Mountaineer! Definitely a one of a kind piece of art. A classy way to remember my sweet sister-in-law! And an especially awesome "shout-out" to On the Trolley for donating to further cancer research!! Georgia Fiddle, 5" x 7", 2 Color Relief Print, linocut. In the unlikely event of your purchase is not as expected, please email me A.S.A.P. and the item can be returned in good condition. The buyer is responsible for the shipping cost of the returned item. I accept payment via PayPal. It is safe and secure. We will always ship to the address you provide to Etsy not your Paypal address. All shipments will be made via USPS unless specifically requested by the customer. All shipments will be made between 1 - 3 days after payment is received. Upgrades on shipping can be made, but will be at the cost of the buyer. We do our best to accurately photograph and represent the print you will receive. Due to the nature of letterpress printing and other hand printing techniques, variations in impression and color may be noted. This is the part of printing by hand that we love, as it really does ensure you get a one-of-a-kind piece. OnTheTrolley reserves all rights protected under the United States Copyright Act in all artwork and/or products purchased by the purchaser. The sale of a given artwork and/or product does not include any assignment, transfer, or license to purchaser of the right to reproduce, modify or create derivative works of any artwork and/or product, unless such right is expressly granted in writing by OnTheTrolley.